Buck Brothers chisels are not your typical chisels. This Buck Brother’s 6 Pc. 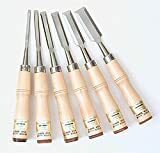 Firmer Chisel Set is made of the highest quality hardened steel that holds an edge longer than any chisel I have ever used Once you use a Buck Brothers chisel you will never try another and once you try one will understand what I am talking about. Quality affordable tools made is USA by Buck Bros.
High carbon steel blades hardened and tempered to hold a fine edge. Firmer chisel style features hardwood handle fitted with leather shock washer. Set includes 1/4″, 3/8″, 1/2″, 5/8″, 3/4″, 1″ sizes. Firmer Chisels can be worked by hand or with a mallet. The chisels have a 3″ long high-carbon steel blade (bevel edge) with a stout “tang” firmly embedded in a handsome hardwood handle. These tools are fitted with a beautifully lacquered 6″ harwood handle finished with a leather cap to withstand mallet impact. We brand these tools with our Diefenbacher label. Made for us in the USA by Buck Bros.
Buck Bros Paring Chisels. Their robust handle provides a comfortable grip and the long blade is for taking fine cuts in areas which cannot be reached with bench chisels. Buck Bros Paring Chisels are intended to be used by hand only – not struck with a mallet. Their robust handle provides a comfortable grip and the long blade is for taking fine cuts in areas which cannot be reached with bench chisels. The authentic design of these tools provides a valuable link to the past and a rare opportunity to participate in the proud tradition of a fine company which has manufactured continuously in Millbury, Massachusetts for over 150 years.